Saying Steve Jobs is tight-lipped is like saying the sky is blue. Rumors may fly in advance of Apple (AAPL) product launches, usually whipping up a frenzy that puts said product, real or imaginary, in quasi-religious terms. 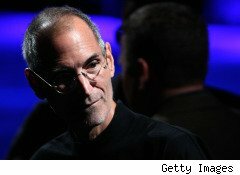 But you won't hear a peep from Cupertino until Jobs (or a proxy) takes the stage, standing in front of mammoth projection screens, to unveil the company's newest game-changer.But it appears that Jobs, who turns 55 next week, may be mixing up his moves as he gets older. Apple's CEO has authorized Walter Isaacson, former managing editor of Time, to write his biography, according to The New York Times. It's a curious move on a number of levels. Jobs has never cooperated with anyone who's written a book about him, evidently going so far as to compel Apple stores to stop stocking other books from publishers who sell those unauthorized tomes. Even though the Times says the book will cover Jobs' life from childhood to his Apple years, this is a man who for years hid news of his battle with pancreatic cancer and reacted angrily when a journalist unwittingly tweeted from a borrowed iPad. So the idea he would suddenly turn candid, and let Isaacson into every private aspect of his inner life, is at best unrealistic and at worst ludicrous. Isaacson, who's president and CEO of the Aspen Institute, has always concentrated his biographical efforts on the likes of Albert Einstein, Henry Kissinger, and Benjamin Franklin: giants of American political, historical, and scientific thought. But the Apple CEO is by far the youngest and most contemporary subject Isaacson has considered, and he presides over a technological and future-forward world, not one that reeks of history. It's like Alice Schroeder in reverse, if she had elected to write about Adam Smith instead of taking a $7 million advance to collaborate with Warren Buffett on his biography, The Snowball. Not to mention that until very recently, Isaacson was evidently telling people he was hard at work on a biography of Louis Armstrong -- territory covered to critical acclaim in Terry Teachout's Pops, published two months ago. An Apple representative, naturally, told the Times, "The company does not comment on rumors." But one has to imagine that this project, should it truly come to pass, will be tough to keep a lid on in advance of publication, no matter how determined Steve Jobs is that he, and he alone, is responsible for how his own life story should be told.